We celebrated a huge success last week, being crowned 2014’s Best Startup at Web Summit in Dublin! The PITCH competition saw 1500 startups apply for the chance to win €10,000, as well as mentorship from sponsors Coca Cola and a trip to their headquarters in Atlanta. After three rounds of intense pitching alongside other incredible startups, we were named the winners of the Alpha competition. 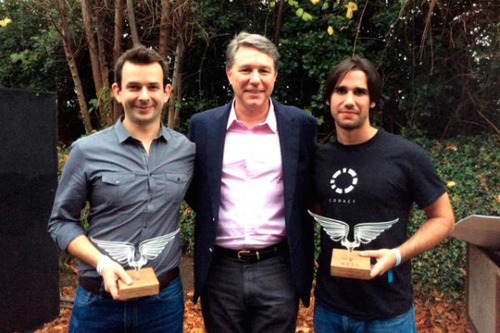 Alex with his award (left), Guy Wollaert, Coca Cola’s CTO (centre) and Jamie Jorge, founder of Codacy and winners of the Beta award (right). Web Summit, hosted in Dublin, is Europe’s biggest technology conference with over 20,000 attendees from around the world. The event sees startups, investors and entrepreneurs come together for an exciting three days of exhibitions, panel discussions and of course, Guinness. 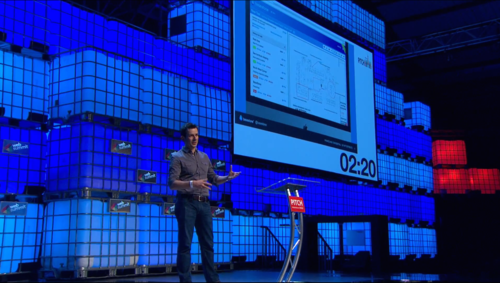 One of the main highlights of WebSummit is the renowned PITCH competition, sponsored by Coca Cola’s innovation fund. Our founder, Alex, delivered a highly compelling pitch showcasing the success of Basestone in driving technological innovation within the construction industry. Having answered tough questions from the panel of investors in the first two rounds, we progressed to the final round of the competition along with two other startups. Judges of the competition included world-leading tech experts and investors as well as executives from Coca Cola. On the final day of Web Summit, each of the three Alpha finalists battled it out and pitched their companies on the main stage in front of over 5000 eagerly watching attendees. Before going on stage, Alex was told that he wouldn’t be able to see the audience because of the bright lighting. Much to his surprise and terror, he could see every single face. We were delighted to win first place, and look forward to working with Coca Cola. Their history of innovation and expertise in industrial infrastructure presents a unique opportunity for Basestone to further accelerate its growth. Pitching was an incredible opportunity in itself and winning the Alpha competition was the icing on the cake. We could not have asked for more and are very grateful to everyone at WebSummit for their support.